In the early 40's the Catholics in Prague, OK were in need of a new church and were hard pressed to find the necessary funds. The pastor, Fr. 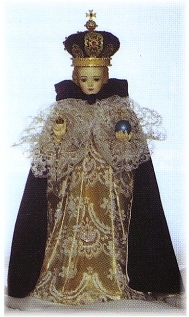 George V. Johnson pledged to the Infant Jesus of Prague that he would build a shrine to honor him if the funding were forth coming. In 1949 the new St. Wenceslaus Catholic Church was completed and dedicated to the Infant Jesus of Prague.